We know how much everyone loves their pets. Zukes has great treats. Christmas is coming, so don’t forget about the fur babies when it comes to stockings. Small-sized treats are ideal for all ages and breeds – great for training! 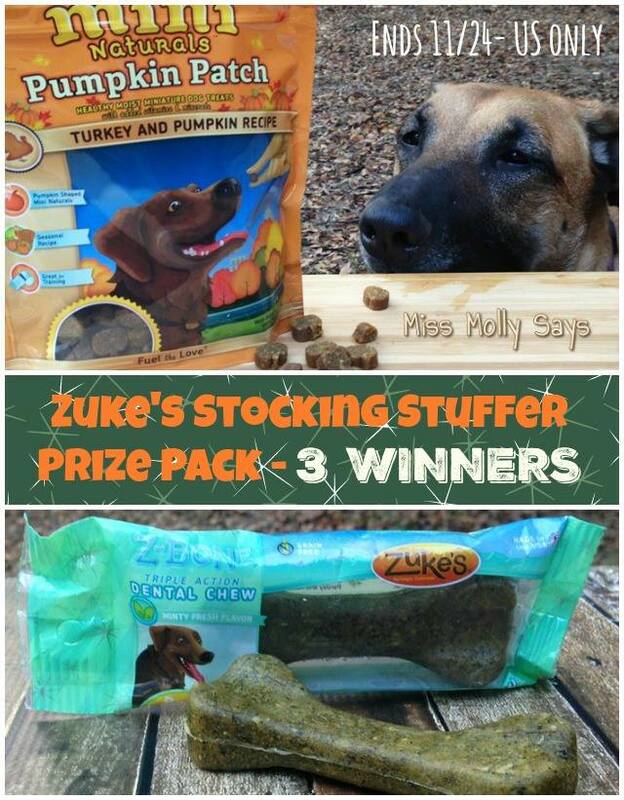 Be sure and read what Miss Molly and the pack thought about the tasty Zuke’s treats and chews in their fun review! Zuke’s Stocking Stuffer Prize Pack! Includes a package of Mini Naturals Pumpkin Patch Dog Treats & a Minty Fresh Z-Bone Dental Chew! 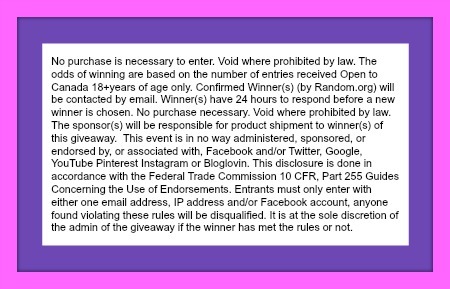 Giveaway ends 11/24 at 11:59 pm ET! Open to US residents 18+ and older. My dogs love their Venison treats. She loves having peanut butter and chicken flavored rawhide sticks. Bella likes those really big rawhide bones & she begs whenever we have steak. My 3 black labs love homemade deer liver treats. Beggin’ Strips or anything that smells like meat and also rawhide bones. people food! LOL….yep, any kind of people food including fruits and vegs – we have a St Bernard mix and Chihuaha mix and both are the two biggest beggars except when there’s a meaty bone, then they don’t know you exist! Rawhide bones are pretty popular! He loves our peanut butter, carrots and really anything that we give him! What don’t they like?! His favorite is rawhide bones. My dog likes Sweet POtato Fruitables. My dog’s favorite treat is cheese. My little Boston loves anything beef flavored! My dog loves milk bones and beggin’ strips. I would say that turkey/chicken is my dogs favorite treat. My dog loves the dental sticks! My sisters dog loves pupperoni. My 6 year old golden retriever loves all sorts of treats. He enjoys eating treats that are peanut butter. Anything with venison, especially venison jerky. Sweet potatoes and pumpkins are another favorite in their treats. My dog likes homemade dog treats the best or ZUKES!